CLICK HERE TO EARLY BIRD REGISTER! no rodeo experience is necessary. All contestants will receive a free McDonald's Coupon! 1st place winners in each event receive 4 free rodeo ticket vouchers for tickets to the saturday matinee performance. a limited number of stick horses will be available to check out for those children who do not have a stick horse. but if possible, we recommend that kids bring their own stick horse to the event. The Bronc Rider begins his ride in a miniature bucking chute on his stick horse. His 6 second time begins when the chute gate opens and he bucks out holding on to his stick horse with one hand, and the other hand high in the air. The rider is judged on his control during the ride and the presentation of his ride. Scores usually range from the 50's to the 80's. Highest score wins. The miniature barrels (3) are set up in the arena in a cloverleaf pattern. The rider must come into the arena and run her horse around each barrel in a cloverleaf pattern without knocking them over and then back to the alley with great speed as this is a timed event. A five second penalty is accessed for each barrel knocked over. Fastest time wins. 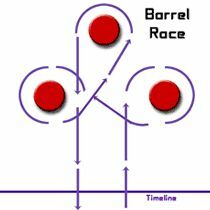 View the barrel racing pattern HERE. There are 3 poles in the center of the arena approximately 5 feet apart. The pole bender contestant starts his or her run from the entrance of the arena with great speed. Time begins at a designated starting line. The pattern is in and out of the poles down there and back without knocking one over. Time stops at the designated finish line. A five second penalty is accessed for each pole that is knocked to the ground. The fastest time wins. View the standard pole pattern HERE. 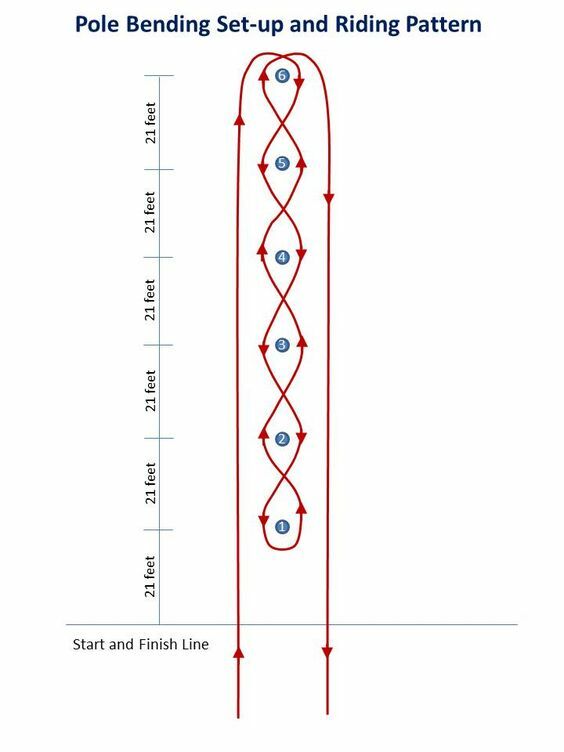 Time starts when racer leaves the starting line. The flag racer will run down the arena, take a flag from a bucket, and run back to starting line. Fastest time wins. View the Flag Race pattern HERE. Each of the cowgirls will be introduced and upon their name being called will have the opportunity to step forward, then wave and smile at the judges. Judging will be based on execution of the smile & wave, as well as choice of western attire. Just stay on 6 seconds and you've got it made! The rider comes out of the bucking chute holding on with one had to his stick bull and one hand high in the air. The rider is scored on his control and presentation of his ride. The rider receives no score if he bucks off or falls to the ground before the 6 second time. Scores usually range from the 50's to the 80's. The highest score wins.